TransFirst is a credit card processor that has been assisting businesses and their clients for over 20 years. Credit, debit, and gift cards are three of the most common ways that consumers pay for their goods now; in order to attract new business, and keep loyal customers coming back, businesses must offer consumers a way to pay regardless of how they use their money. Through their 1,300 distribution centers and counting, TransFirst helps partners do just that. TransFirst serves retail businesses, healthcare facilities, financial institutions, and other sales partners, from one of their five operations facilities that cross the nation. Not only do they provide credit card processing services, they also act as technical support for their products, and offer risk management services to help businesses succeed at every level. With so many different credit card processing software companies out there, it can be hard to stand out. TransFirst achieves that, for reasons that are both good and bad. They are one of the most affordable options in the industry, with discounted monthly rates that start as low as $5 per month, and a 30-day free trial that anyone can take advantage of. Their yearly fees start at under $100, which is nearly impossible to find in other companies. 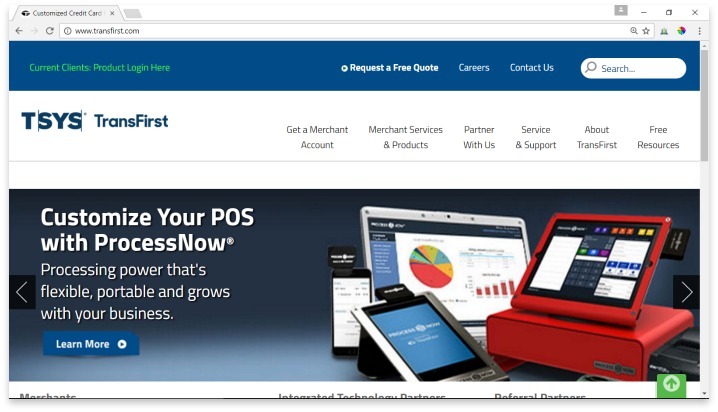 Additionally, TransFirst is doing everything they can to keep your business running smoothly with the newest technology; they offer tools so that you can process payments from tablets or smart phones, and the ability to accept payment from PayPal in addition to credit and debit cards. As with many similar companies, TransFirst requires a contract for its services, and getting a contract to review before you go through the lengthy application process may be a problem. They don’t offer transparent information about what their contracts include besides the basic terms. Additionally, they offer a separate equipment lease, for companies who don’t wish to buy equipment outright, which has been the source of major customer dissatisfaction. Equipment leases don’t always end when the service contract ends or is cancelled, and customers who don’t understand this fact may be surprised to find that they are still paying on obsolete technology after their service ends. The TransFirst team doesn’t assign a single representative or agent to your account; instead, you’ll be speaking to whoever answers the phone if you call for assistance. This isn’t the norm for this industry, and may indicate a lack of specialized customer service. However, with all of these complaints, TransFirst has a clear record of solving issues in a timely and professional manner. Of the three years that they’ve been rated by the BBB, they’ve closed 110 complaints, most of which revolved around a misunderstanding of contracts and services. Considering they’ve served over 200,000 customers since opening, an annual average of 36 BBB complaints speaks of proficiency. TransFirst is one of the most affordable options in the industry, and offers the newest technology and tools to help your business run smoothly. If you run a small to medium-sized business and can’t or don’t wish to budget for major credit card processing fees, TransFirst is one of the best options out there. You’ll still be able to get all the newest ways to process payments without the higher costs. But be sure you read the fine print and understand exactly what you are getting into before you sign. Have you had an experience with this company? Please share your TransFirst reviews below.